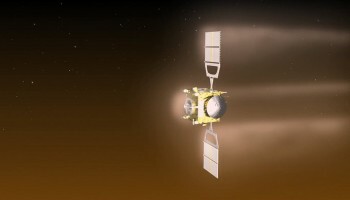 On 16 December, ESA’s hugely successful Venus Express mission came to an end after it exhausting its remaining propellant as of 28 November (see “Venus Express goes gently into the night“). No more fuel means no more ability to control the spacecraft and keep the high-gain antenna (HGA) pointed toward Earth, which in turn means there is no way to upload telecommands nor receive telemetry (including the on-board housekeeping data). Basically, Venus Express is ghosting along in its orbit, with the pericentre height (height of closest altitude above the surface) during each orbit steadily decaying due to gravity and natural perturbations. But while no more science data can be gathered, and no more attempts to send commands will be made, the operations team at ESOC are able to continue monitoring radio signals from the spacecraft; they can ‘see’ the X-band carrier wave being transmitted from the spacecraft’s high-gain antenna despite the fact that it is not pointed at Earth, although this, too, is steadily dropping off. The intrepid craft may be stuck in Sun-acquisition mode. This could mean it is maintaining a coarse pointing with the solar arrays and HGA pointed approximately toward the Sun, within perhaps 5 degrees or so. But whether pointing toward the Sun or not, the HGA is not pointing toward our ground station on Earth, and as Venus and Earth move in their orbits, this off-Earth pointing (see ‘Sun-spacecraft-Earth angle’ in the chart) is becoming larger. This means that the strength of the received carrier signal is steadily declining. “On New Year’s day, we saw a weak but detectable signal level and could lock onto it for most of the almost-5-hour tracking pass using the Cebreros deep-space tracking station,” says Rick Blake, Venus Express spacecraft operations engineer at ESOC. “We plan to continue monitoring the signal level in January until we see it has disappeared for good,” says Blake. In an earlier email, Håkan Svedhem, ESA’s Venus Express project scientist, said he expected the pericentre altitude to drop to about 130km around 12 January and 120km around 20 January. This will be unseen by any human, and it appears that we’ll never know when it actually happens. “It will be destroyed in the atmosphere most likely toward the end of January or early February,” says Patrick Martin, ESA’s Venus Express mission manager. But while the spacecraft will burn up in the dense Venusian atmosphere – experiencing a lonely and poignant end – the science and operations teams on Earth will begin work on the important post-operations phase. This will ensure that the vital science and flight data recorded during eight years of exploring Venus are available to current and future researchers, making a fitting legacy for such a successful mission. Many apologies for the re-post of what I posted in the Facebook comment section before. I’m sure I have no reason to post this again if I can post this here. Thank you Venus Express and all involved in the mission! And maybe more than that, as a supporter of Planet-C I love to say, THANK YOU VERY MUCH for having waited for Akatsuki-kun at Venus!! Maybe it had already happened before that, but it was my first time that when Akatsuki-kun was about to try entering the orbit of Venus I clearly noticed that space missions are cheering each other in public places (social medias etc) no matter whom each of them were designed and build by, no matter which space agancy they are from. This is almost quite normal today. But at that time I sensed that this fashion generated a new “vibration” with involving public, which I imagine can never happen when only cheering each other in the corridor in a science conference. To me it looked like something that may be able to play a role (even a small one) to make better and/or deeper future connection/collaboration between space agencies. Or might be even between people in different countries. When some months later I heard from Akatsuki-kun’s team that (someone from) Venus Express team told them that VEX was still waiting for Akatsuki-kun’s arrival, it did hit my heart so strongly and so warmly. What a cheering, what a support. VEX team must have known that Akatsuki-kun’s next chance would be 4, 5, 6 years later and it’s totally out of Akatsuki-kun’s designed life, and also might have known that Akatsuki-kun is from a space agency that has never succeeded to enter orbit of a celestial body with huge gravity other than Earth. Thus Venus Express became a spcial spacecraft to me. The collaboration between Venus Express and Akatsuki-kun seems ending up as an unrealised plan, but at least I hope Akatsuki-kun will follow Venus Express’s this attitude, no matter next attempt to enter the Venus orbit will be successful or not. It’s a bittersweet feeling. Sad but also in my view Venus Express was able to end up as a very happy spacecraft for having continued operation for the purpose until all the potential ran out. So congratulations to the entire Venus Express team. Job well-done Venus Express!! MISSIONE PERFEZIONATA CON SUCCESSO! BRAVI! MANCANO SOLO 11 KM DI AVVICINAMENTO AL BURNING LEVEL! SE CI SONO BATTERI O ALTRO RELITTO VIVENTE, MUOIANO IN PACE NELLE ARIE DI VENERE! Sweet dreams Venus Express! Hopefully all the information you’ve gathered will be looked through in good time. With MESSENGER ending in 2015 we might be without any probes for the inner planets. Hopefully Akatsuki will make it to some kind of Venus orbit though. Do you think you will know roughly when VEX gets eaten by the atmosphere, or does the signal strength (or potential tumbling due to the atmosphere?) mean you probably won’t know when it happens? One thing I’ve wondered about this is whether there were any plans to let VEX plunge into the atmosphere until destruction while it could still be controlled. Thus you’d get information from even deeper than during the aero brake campaign. Without exact information as to how much fuel it still had left you could obviously only deal with probabilities, but was there any consideration made to an ultimate atmosphere dive versus an unknown time of continued routine science operations?